1980, Chris Tsangarides, Rodney Matthews, Robb Weir, ok, please find the error. 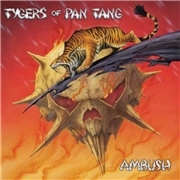 This is 2012, and the revamped TYGERS OF PAN TANG, ok seasoned since they stepped back into action in 2001, with Robb as the main man, are well on their way. Along since 2001 are Dean Robertson, lead guitar, and Craig Ellis, drums, and later additions are Italian (!) vocalist Jacopo Meille, and recent bass recruit Gavin Gray (ex. BLITZKRIEG). And since the reformation the band, albeit in changing form, has produced some nine discs all in all. If they were rubbish this would of cause not happen, but what about this their most retro-looking output in recent years? I might have said something about Jacopo being Italian in the past, but the voice on the excellent opener “Keeping Me Alive” shows little evidence of his origins. Instead we get true NWOBHM, all guns blazing, with great sound by the maestro himself. The use of overlapping voices is a great feature and I can´t get the bloody tune out of my head. “These Eyes” sounds more of a DOKKEN riff to me, luckily, but is still a solid effort. And “One of a Kind” is slightly less prolific, but sports agreat bass line from Gavin. Their humor is still alive too, just listen to “Rock´n´Roll Dream” and the magnificent “Hey Suzie”. If you have been along long enough you´ll smile in recognition as a far more experienced Suzie re-enters the band repertoire, even with a slight return to their trademark riff off “Suzie Smiled” from 1980. But to show their level of seriosity they include “Play to Win”, “Burning Desire” and the closing track “Speed”, songs that can compete with their most famous numbers any day! Especially “Play to Win”, which to me is right up there with the likes of “Rock´n´Roll Man” and “Gangland”! The entire package lives and breathes true TYGERS OF PAN TANG mentality, and must surely bring a smile to every ex. members face.